Over dinner in May of 2011, on our second anniversary, Dave and I discussed family values. We both came to the table with our own ideas, and after much deliberation, we decided on 5 core values for our family. More than a year went by, and while this discussion was not forgotten, it was something that took a back seat to life. Fast forward to the summer of 2012. Baby boy number two joined us in April, and we moved (again) in June. Life in the THICK weeds. Unpacking and decorating commenced, and so came an opportunity to display our family values. Displaying this in our home has caused a bit of a crisis of conscience for me. 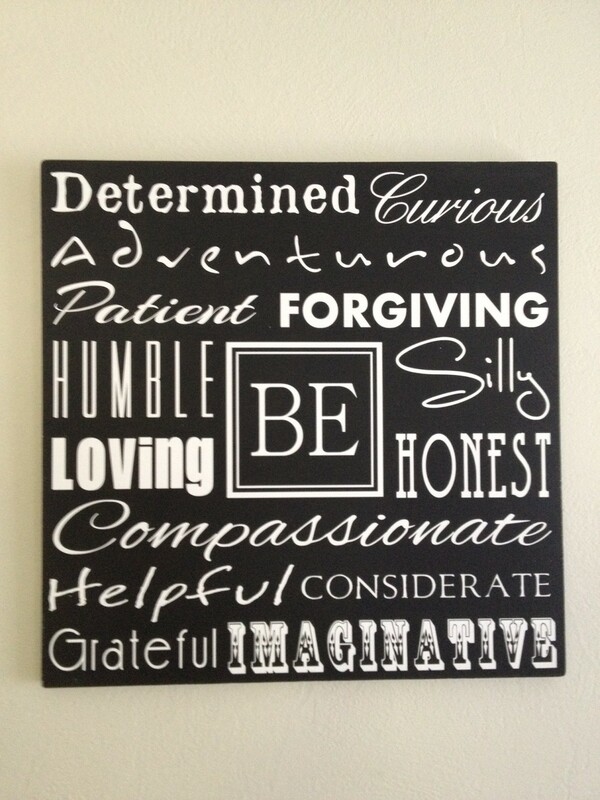 Do I emulate these values in my own life enough to expect them in my children (and husband for that matter)? My goal is to find a way to parent that incorporates love, determination, curiosity, honesty and consideration into daily life. With awareness, (and more sleep) I am sure that it is possible. I was very fortunate to have grown up in a family full of love. I have fond childhood memories of parents that modeled a loving marriage. I fully realize that this was a fabulous and rare gift that they gave to their children. Yes, every parent has flaws, but we were verbally told that we were loved often, we felt safe, and we received affection. Dave and I will/are doing our best to model love for our tiny men. I also know love because of God, who sees the depths of my heart, and loves me the same (to quote Chris Tomlin). It is my heart’s greatest longing that my boys will know the love of Jesus, and that they would love people openly and without reservation. I get distracted easily. I wander to places of doubt and worry when trouble hits. I need reminders of where I am going and redirection in times when I lose my way. Determination for me means staying the course; riding out the storms and challenges without giving up or wavering. I already see glimmers of determination in both T and L who are both quite persistent. Of note: I am choosing to see their behavior as being determined instead of stubborn. In our boys I want to foster curiosity in such a way that their minds are creative and challenged. I want them to ask questions about their world and their place in it. Dave would really love for me personally to be more curious about new tastes and ethnic foods specifically. I have never had a very expansive palate sadly. Can you say garlic salt and lemon pepper? I feel like I need to go on the hunt for a book on how to raise honest kids. (Suggestions welcome) We are not in the age of fibbing yet…but it is coming for us. Unfortunately, kids do not have to be taught to lie. As for me, I will model honesty by letting my YESes be YESes, and my NOs be NOs both at home and at work. Consideration was one of the last items added at our anniversary dinner in 2011. We talked and dreamed about serving our community as a family, and putting others before ourselves. In the minutia of the day to day, this has gotten a bit lost. It is an item I intend to focus on in 2013. I am humbled by Dave’s willingness to endure my faults, and for his encouragement and companionship on this journey. Bottom line…I am flawed, and I need to remember that it is all a process. Most days, of all of the words on our wall, it seems like the only thing we do well is being silly. Silly lives at our home, and it makes the seriousness of life melt away. My food budget recently underwent an extreme makeover during a visit from my super-mom friend Val. 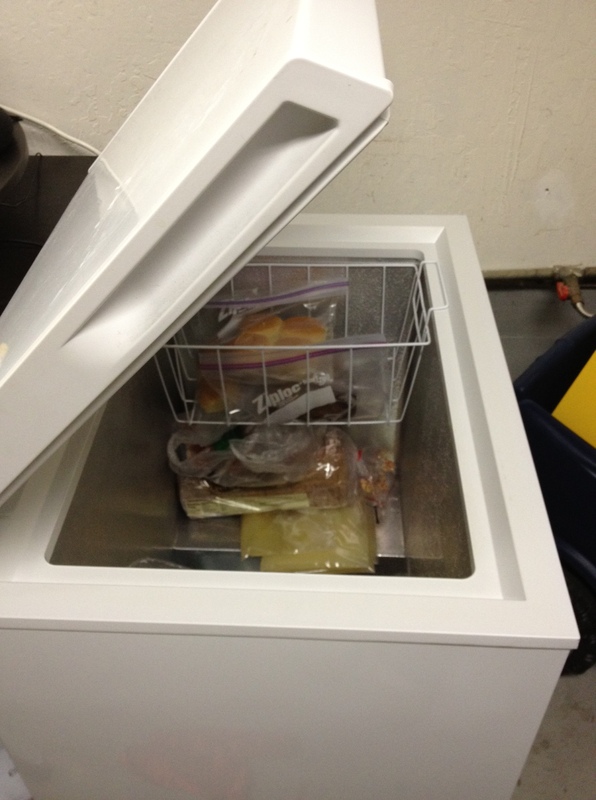 She taught me how to leverage my freezer to reduce spending, and reduce food waste. It was a turning point. So much so, that I bought a cute little chest freezer from my friend Georgette! Note all of the empty space in there. The book is a little agro, but I am using many of her suggestions. One fabulous one is to just double/triple the recipe of whatever you are making some evenings, and freeze batches for another night. Brill right?!?! My mission to cook ahead would be so much more fun with a group. Would anyone on the peninsula like to do a “frozen meal exchange” with me?!? We could do a 1:1 exchange of both a meal and the recipe. This will not only give us each a bit of variety, it will expand everyone’s recipe box! Crushing confession: I am not overly friendly unless we are friends. This is an ugly, do-not-shine-the-light-on-this-area, kind of confession. I avoid eye contact, do not initiate conversation, and certainly do not frequent situations that push the boundaries of my comfort zone. Somehow I feel like this is out of my control. Old anxiety tapes play in my head, and it just makes me so dang uncomfortable. Did I just say something DUM? Do I have food on my face? Did I remember to brush my teeth? Wait…do I have a bird in the sky!?!? My heart races and it envokes a flight response. Hurry…make an excuse…get out. My dilema becomes a painful reality when I take my kids to the park. I scan the area almost as soon as I arrive. Where are the other moms in dirty yoga pants and a baseball hat? (My go-to staples) Where are the frazzled, clearly did not get a shower, looks like she got maybe 40 minutes of sleep kind of moms? I might stay longer if I found a park full of these moms. I want to relate to the ones that are all showered with their knee-high boots and long super cute sweaters with chunky scarfs. They are usually chatting with other a-dorable fashionistas, and there is ZERO chance that I would muster the courage. Ugh…Why do I feel like I am back in highschool when I take my kids to the park?!?! The time is coming when T will make friends. I will be forced to talk to moms that I do not know. Maybe I will make new friends. Maybe I will find a community. Maybe if I look up from my little world view I will find other moms that are looking for the same thing. Maybe. 2012 was hard. I understand that it is relative, but for me, it was hard. New baby, new address, new job, new financial challenges. Sanity. I became acutely aware of the difference between the baby-blues and post-partum depression following baby number two. Before this experience, I naively thought PPD was something you could choose to smile your way through. I mean, you just had a baby…shouldn’t that make you insanely happy?!? While I will leave the details for another post, L is 9 months today, and the weeds are getting shorter every day. My plan is to sleep more, to write out my thoughts, and to find some quiet amidst the noise. Sensibility. At the end of 2012, we determined that our first son T would require some developmental assessments and possible therapy. (They no longer call them “late bloomers” btw) The Google machine led me in many directions, but one that particularly resonated with me was environmental toxins. What role are toxins playing in the development/behavior of my son? Could I be exposing him unknowingly to dangerous items which manifest in these delays? There was no way to be sure, but just in case, we did a home detox. We said goodbye to ALL chemical cleaning products, all personal care/beauty products containing questionable ingredients, and we committed to knowing exactly what is going in our mouths. In our home, I can and WILL control what we breathe, what we put on our skin, and what we eat. I am also learning to control our budget. By learning I mean the elementary school, possibly kindergarten, kind of learning. Like…the “let’s practice our letters” kind of learning. Yeah, I am thirty-some, and have never lived on a budget. This B word has led me to go on the hunt for value. At what store can I find the cheapest (fill in the blank) and still not sacrifice food/product quality. I am finding both areas of sensibility exhausting in the read-every-label and bust-out-the-calculator-to-find-the-per-ounce-price kind of way, but I am unwilling to drop either cause. Service. Before I was married, I gave much of my time to our church’s high school ministry. I cherished this time, and made some of my favorite memories with this wonderfully amazing group of young people. After my PPD adventures, in a way that I cannot really describe, I felt connected to other new moms. Not just moms with multiple kids, but any mom with a new little tiny. Most new moms go through feelings of inadequacy, but not many speak up about needing help. I am still sorting through how this will play out this year, but I want to help. I will find a tangible way to help. Given my paralyzing inability to talk to people I do not know, this will stretch me. Bring it. It is quite clear that I am not capable of much without God. He has been calling me back to him for several years, but the mud is THICK, and I have so.much.baggage. He is patient, and very very gracious. It is time that I return. I need community. I need accountability. I need study. I need grace. I know I will find all of these things when I return. 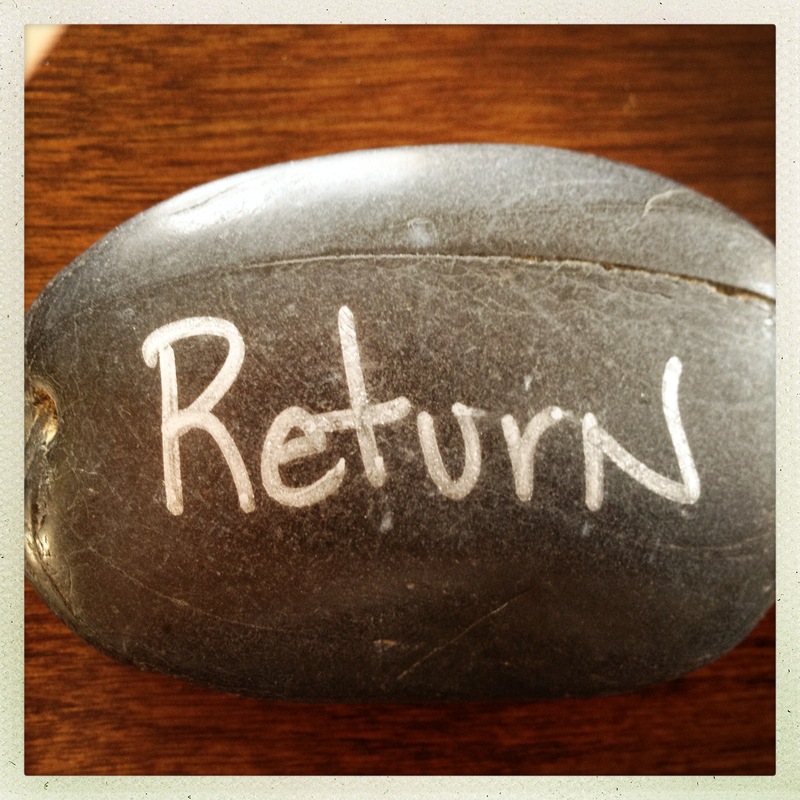 So 2013, be good and gentle with me and my family, and may I be met with constant reminders of my declaration to return.